Without question, the most famous battle of the American Civil War took place outside of the small town of Gettysburg, Pennsylvania, which happened to be a transportation hub, serving as the center of a wheel with several roads leading out to other Pennsylvanian towns. From July 1-3, Robert E. Lee's Confederate Army of Northern Virginia tried everything in its power to decisively defeat George Meade's Union Army of the Potomac, unleashing ferocious assaults that inflicted nearly 50,000 casualties in all. Day one of the battle would have been one of the 25 biggest battles of the Civil War itself, and it ended with a tactical Confederate victory. To an important degree, Gettysburg played out as it did because of the Union Army's most famous brigade. 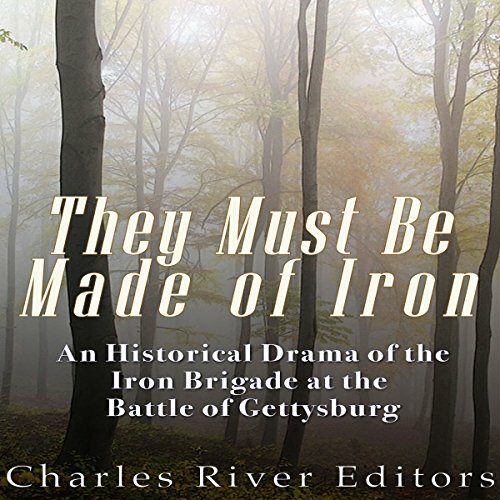 The title of "Iron Brigade" has been given to a number of different US Army brigades over the last century and a half, but it has become almost entirely synonymous with the Civil War soldiers who fought in the brigade for the Army of the Potomac. Also known as the "Iron Brigade of the West", "Rufus King's Brigade", and the "Black Hat Brigade," the Iron Brigade was comprised of the 2nd, 6th, and 7th Wisconsin Volunteer Infantry Regiments, the 19th Indiana, Battery B of the 4th U.S. Light Artillery, and later, the 24th Michigan. The Eastern Theater of the Civil War saw the bloodiest and most famous battles, as well as the biggest losses, giving the brigade a chance to demonstrate its mettle during legendary confrontations with Robert E. Lee's Army of Northern Virginia, most notably during its heroic actions on the first day of Gettysburg, which historian Alan T. Nolan once called the Iron Brigade's "last stand". Would you try another book from Charles River Editors and/or Scott Clem? Has They Must Be Made of Iron turned you off from other books in this genre? Who would you have cast as narrator instead of Scott Clem? What character would you cut from They Must Be Made of Iron? This story was supposed to be about true events however, the main character seemed almost super human. It basically described all the gory ways he killed about 20 or so men on the first day of Gettysburg. The narrator seemed like a middle school english teacher reading to a class. There was no artistic inflection or attempt to bring the characters to life.